The land of ALTINKUM (Golden Beach)... the beach that can't be found in any where! 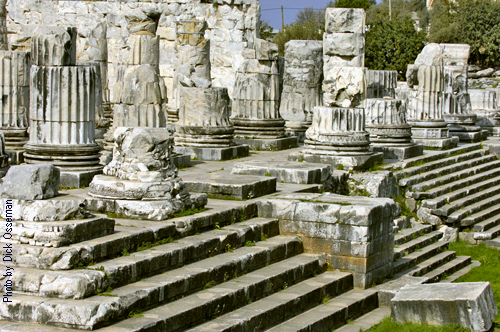 DIDYMA ('Didim' in Turkish) was a sacred place starting from the 8th century B.C. as it was a cult center for the city of Miletos with a spring and sacred grove. 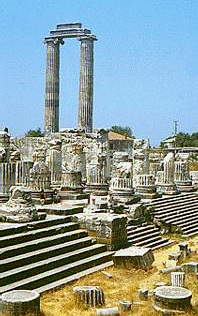 The word Didyma meant 'twins' and was associated by some as being the meeting place of Zeus and Leto to have their twins Apollo and Artemis. For more on history please see the bottom part of the page. 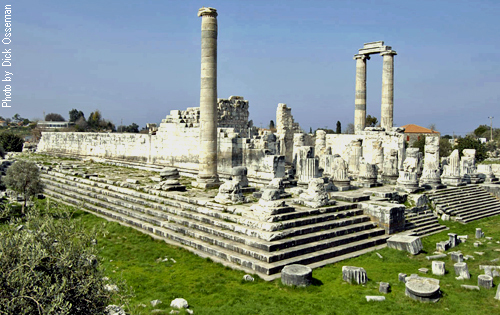 Today this ancient city and its ruined TEMPLE OF APOLLO, is located 2.4mi(4km) inland from very popular holiday resort coastal town of DIDIM, population of 35.000. This small town's earlier Turkish name was Yenihisar but in 1991 when that name was dropped and the town name as DIDIM assigned, according areas historical name. DIDIM is in Söke district of the province of AYDIN and situated on the south-west Aegean coast of Turkey, between BODRUM and KUSADASI. DIDIM is the "Gateway to the Land of Oracles", where tourists can visit famous sites such as the ruins of the Temple of Apollo, which is the only major historical point of interest in Didim itself, and the other of ancient Ionian cities of Miletus, present-day village of YENIKÖY and Priene, present-day village of GÜLLÜBAHCE by a Turkish name, and also not forgetting of course, the ancient metropolis of Ephesus and The House Of The Virgin Mary are in easy reach locations. Area has a fairly flat geography and a widely scattered pattern of settlements. DIDIM's main route of connection is the through SÖKE – BODRUM highway. Again, transport by air is through BODRUM 55mi(90km) and Izmir's Adnan Menderes Airport, 91mi(150km). DIDIM was nothing but a small village 20 years ago but now it become one of the major holiday vacation centre in Turkish Aegean Sea coast. Tourism is the main source of income for the area, especially in summer, but agriculture is also an important contributor, the main crops are wheat and cotton. A few minutes away from DIDIM comes Turkey's one of the best natural beach ALTINKUM (The golden sand). Whole ALTINKUM shore embraces thousands of islands of which some are not even shown on the maps and with its curved shores, this shore can not be described easily because it is absolutely beautiful! The whole area offers beautiful beaches(3), water sports, good hotels and resorts, restaurants bar, discotecs and a good value holiday for everyone! Todays DIDIM, where the sun and the sea hug each other, it is an ideal holiday resort for those who love aquatics, fishing, diving, sailing, trekking, hunting, history and nature. Didim has over 200 touristic accommodations with a total of 15.000 guest rooms. These rooms come in different price ranges... varying from pensions to camping areas, and from hotels to holiday resorts that will meet your expectations. 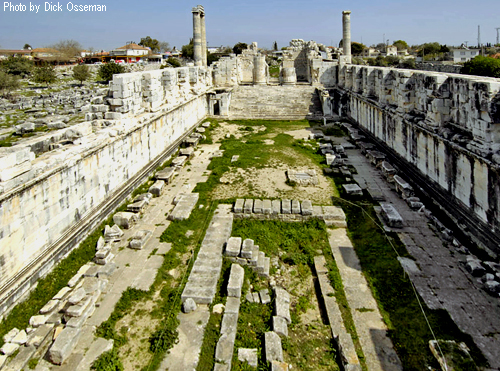 In ancient time Didyma was on the sea side and following the shore a road ('Sacret road') from Miletos was connected to the harbor of Didyma, called Panormos. Road continues to the south again and on either side of the road there were statues of recumbent lions, statues of the priests of the Temple of Apollo. Entire 'Sacret Road' is stone paved. The Hellenistic ARTEMIS TEMPLE measured by 33(~109 mt) by 15(~51 mt) feets and had a total of 124 columns. Columns are still standing. In the temple grounds are fragments of its rich decoration including a striking head of Medusa (she of the hair of snakes). Temples were destroyed by the Persians in 494 B.C. 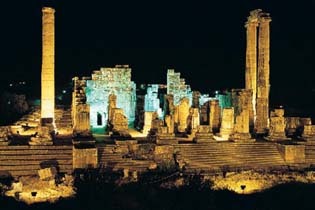 then rebuilt by ALEXANDER THE GREAT's orders. Sometimes after it toppled by an earthquake. Pillaged for stone by the locals there after and then for statues by the British Museum in 1858. It now stands beside the main road and surrounded by a fence next to boxes of modern Mediterranean houses. The Temple of Apollo was a major monument is it's day, however now not much of it's sanctuary can be seen. What can be seen is a collasal, unfinished Ionic temple. We hope YOU make TURKEY(Türkiye) and helloTURKEY.net, a part of your travel plans soon!